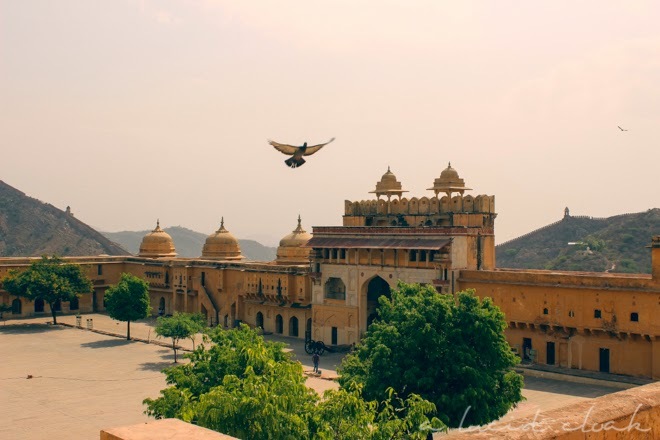 City of maharajas, opulence, rich silks, jewels, elephants — Jaipur embodies everything stereotypically Indian and Bollywood. Cleaner and friendlier than Agra and Delhi, it was my favourite of the three cities we ventured to during our eight days in India. 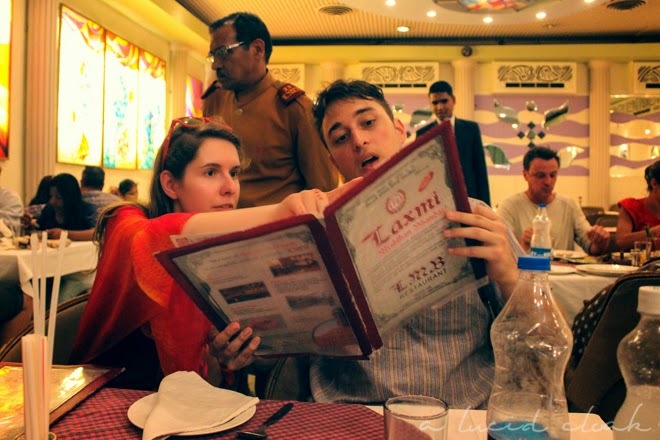 Undoubtedly one of the highlights of Jaipur was the hotel we stated in — Hotel Pearl Palace. We had originally booked a four person family room, but they had mixed up our order and couldn’t get that exact room for us. 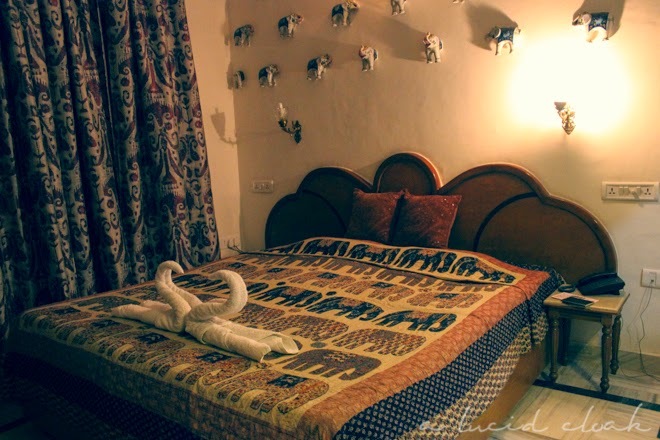 Instead, they upgraded us to two separate rooms — each complete with a huge bed, intricate artwork, and mosaic tiles in the bathroom. The greatest part was that we still only paid $10 per person per night! 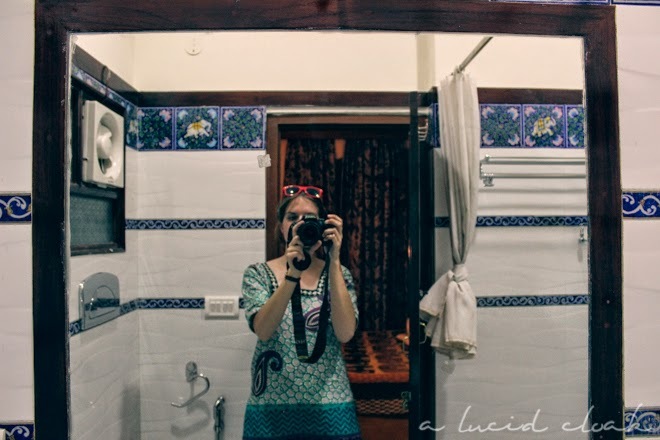 Staying at the Pearl Palace made me believe that I myself was a maharaja (almost). Since we had such a great experience in Delhi with our driver Riyaz, we decided to hire another driver for the whole day in Jaipur. Unfortunately, the experience was not quite the same. 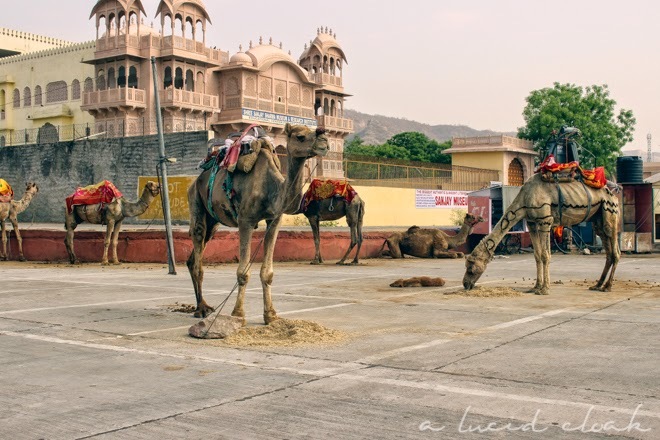 He was half an hour late in the morning when we wanted to get to the Amber Fort before all the other tourists did. The four of us decided to grab a tuk-tuk off the street to get there, but halfway through our journey to the fort, we noticed that our driver Salim had caught up with us and demanded that we go with him! Our tuk-tuk driver was apparently his “brother”, and he wouldn’t let us continue along with him so we had to switch vehicles. Salim refused to give us a discount despite the kerfuffle, and he kept begging us to go to jewellery shops, cloth factories, etc… half-way through the day, we all got so annoyed of him that we just handed him money, told him to leave us alone, and practically ran in the other direction. 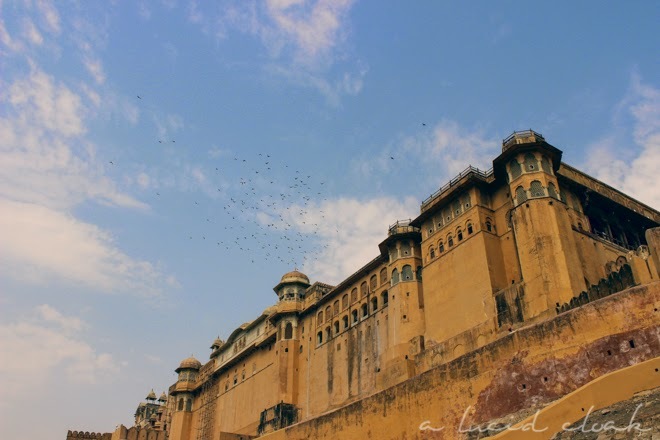 The Amber Fort was by far the most beautiful experience in Jaipur. 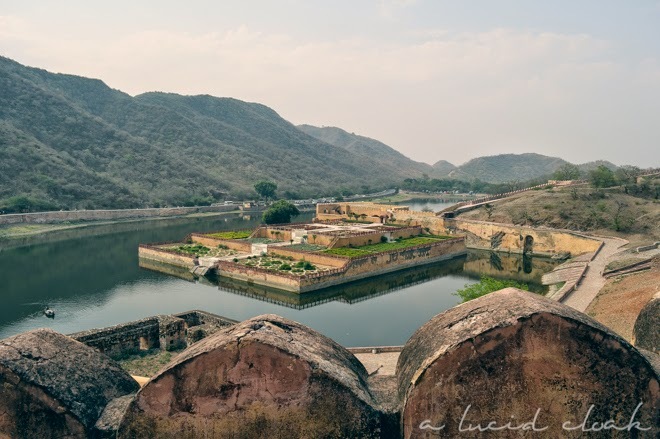 The four of us decided to dish out $17 per elephant to get from the bottom of the fort to the top, which is exactly how the maharajas of old made the trip. 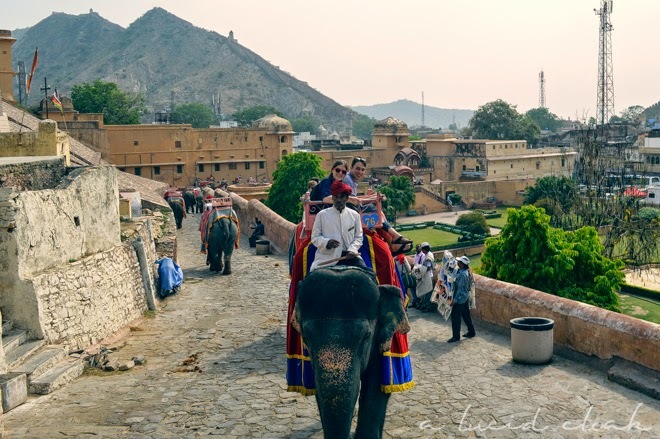 Our elephant, Shanti, was painted so pretty, and despite the discomfort of sitting atop our elephant Shanti, swaying back and forth, and constantly feeling like we would fall, the view from up high was incredible. India and scams are synonymous, and our elephant driver Islam only encouraged this stereotype. He told us to give him money so that we could feed the elephant a banana once we got off… but as soon as we got off the elephant, he rode away on it, waving and smiling at us. Of course, right as we turned around we saw a sign that warned tourists to not give money to anyone asking for it because it is most likely a scam… ah, well. It wouldn’t be India if you didn’t get scammed at least once a day. 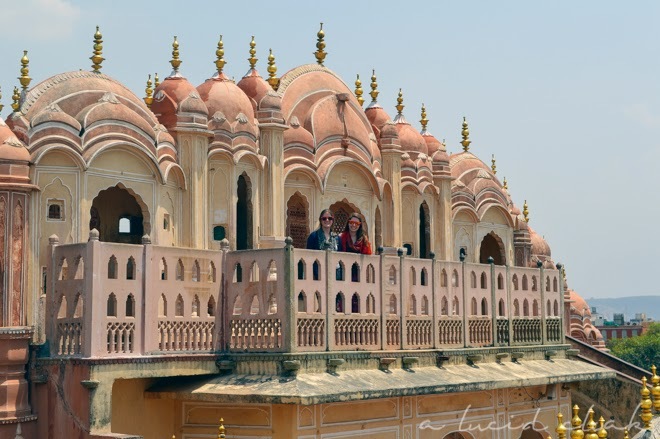 Some of the other sites we visited were the City Palace, the Jantar Mantar, and Hawa Mahal. All three were so different and full of exquisite architecture. An adorable little Indian child stumbled up shyly to me as I was sitting in the Jantar Mantar complex. She handed me a small chocolate bar, smiled, and quickly ran back to her parents who waved to me. Faith in humanity = restored.